You are a U.S. Citizen and have decided to get married overseas in your partner's country. Accordingly, you should look up any requirements that his or her country has with regard to marriage to a foreigner. In similar fashion, you need to look up any requirements that his or her country has with regard to leaving the country on a U.S. CR-1 Spousal Visa. For this purpose, the best way is to first consult with the U.S. Embassy or consulate in his or her country to find out the requirements. For example, check the embassy website or call the embassy by phone. 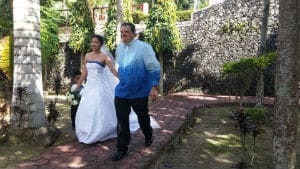 Lea and I married in the Philippines, therefore, we know the Philippine government requirements to marry and leave the country on a CR-1 Visa. As a result, we are sharing the Philippine IR-1/CR-1 government requirements with you. The Philippine government requirements to marry in the Philippines are found on the U.S. Philippines Embassy website HERE. In Contrast, there are fewer requirements for those engaged to a U.S. Citizen and leave for the U.S. on a K-1 Fiance(e) Visa. These requirements are found HERE. For this purpose, this post is only on the Philippine government requirements to marry in the Philippines and then leave the country on a CR-1 Spousal Visa. #1 Obtain Legal Capacity to Marry. #1 Attend a Commission on Filipino Overseas (CFO) seminar and obtain stamp. Visit our blog post "Spousal Visa Philippine Government Requirements" on our website LoveVisaLife more detailed information on each of these 4 requirements.